What Does It Mean to Nourish and Cherish Your Wife? Did you ever play the hiding game where you hid something from your friends, and it was their job to find it? We played this game often as children. I would hide something, and my brothers would search for what I hid. If they got close to the object, I would say something like, “You’re getting warm” or “You’re getting warmer,” if they were getting real close, or “You’re red hot” if they were nearly on top of it. Of course, if they were moving away from the object, I would say something like, “You’re getting cold,” which was their clue that they were going in the wrong direction. I was thinking about this recently during a counseling session where I was illustrating what Paul said in Ephesians 5:29. Paul was counseling the Ephesians to “warm” their wives. 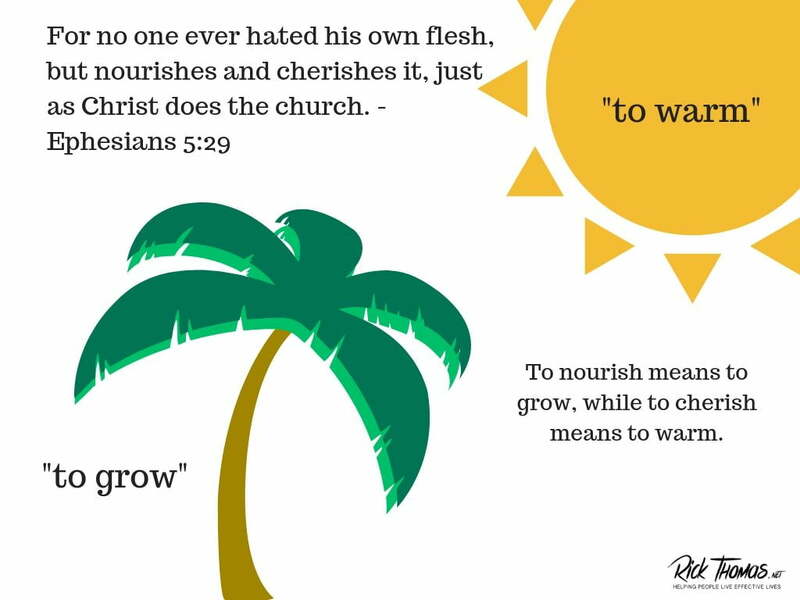 The word nourish means to grow, and the word cherish means to warm. Paul was teaching them that a God-centered, biblical husband is one who “nourishes (grows) and cherishes (warms)” his wife. To illustrate my point to the husband that I was counseling, I drew a distinction between “warm and cold” by writing out specific attitudes and actions that a husband could use to either warm his wife or push her out in the cold, so to speak. Below are the word choices I shared with this husband, plus a few others I’ve thought about since our conversation. You can print this article and circle the attitudes and actions that best represent how you think about and treat your wife. For an extra bonus, you can print this for your wife and ask her to circle the ones you excel in and ask her to highlight the things where you need improvement. Your wife might have a different perspective than you do. I typically have a higher view of myself than what my wife does. When I counseled men, I’ve seen a similar pattern. If I advised a husband without his wife in the room, he tended to give me a better assessment of himself and his marriage. Then his wife came to the next meeting and presented a strikingly different perspective. Her perspective was valuable. No one knows you better than your wife. More than likely she knows you better than you do. Though what I’m asking you to do here might sound like a dare or even manipulation, it’s not: if you’re serious about your marriage, ask your wife to assess you. This interaction could be one of those pivotal points in your marriage because (1) you can model humility, (2) she can exhibit grace, and (3) God can be glorified. Just as there is a “warm list,” there is also a “chill list.” If a man is not warming his wife, he is cooling the marriage by his attitude and behaviors toward his wife. There is no neutrality in any marriage. As for the list below, I have done nearly every one of them in our marriage. Though our relationship is amazing now, it was not always this way. There was a time when I did not like Lucia, and she viscerally and physically responded to my sinful attitudes and behaviors toward her. There is a direct correlation between how a man thinks and responds to his wife and the state of his marriage. If he likes her, the marriage will be heading in a good direction. If he does not, the marriage is on hard times. A man cannot fake genuine gratitude for his wife. If he has it, he will be exhibiting the character traits and behaviors in the “warm list.” He cannot do otherwise. Her radiance is a clue to the warmth she experiences from her husband: she will feel and show his affection. If he does not have it, he will be exhibiting the character traits and behaviors below. And like a dance partner, his wife will be reacting to his poor leadership and bad attitude. You’re saying you do not have to do for your wife what Christ did for you–assuming you’re a Christian. You’re saying it was okay for you to be unlovable to Christ, but it is not good for your wife to be unlovable to you (Romans 5:8). You and I do not have the biblical right to withhold nourishing and cherishing from our wives because they are not meeting our expectations. That is another gospel the Bible does not condone. It took me two years in my closet, praying, asking God to give me a renewed affection for Lucia. It was not as easy as repenting and moving on to the next thing. My heart was selfish, angry, and stubborn. It took many hours of time before God to get my heart realigned to His gospel. Paul would never condone such an adulteration of the gospel. He tied the marriage to the gospel and expected us husbands to model the gospel that he proclaimed. His expectations for covenantal partners is to bring the marriage into gospel focus. The primary person Paul was talking about in this text was Christ. He had Christ and His relationship to His church in mind. He is teaching us about the love of Christ and how that active love changed us (Ephesians 5:25-26). Then Paul transitions by drawing an analogy regarding the husband and wife relationship. He is telling us husbands to love our wives similarly to the way Christ loves His church. Of course, part of the way Christ loves His church is through His ongoing nourishing and cherishing–Christ does not hate His body. If you are a Christian, you have been the benefactor of the Savior’s loving activity. Through the attitudes and behaviors of God’s work in your life, you are growing and changing. Sanctification is what God does for us because we are part of His body. He sees it as His job to mature His body. In like manner, your wife is part of who you are. You and your wife are one flesh. To dislike your flesh is insanity. It leads to suicide or, in this case, it leads to divorce–the aggravated amputation of the flesh from the body. If you nourish and cherish your wife, she will respond to your practical, loving care, similarly to how the church responds to Christ. Your wife was wired to respond to you, not to be repulsed by you. And through your careful nourishing and cherishing she will grow and mature. While it’s true that she can grow in Christ in spite of you, that is not the way things ought to be. You are not called to hate your flesh, but to nourish and cherish it. If your wife is nourished and cherished according to the “warm list,” her growth will be apparent. A wife is a reflection of her husband’s care. Though he can be impressive in his vocation and many accolades can come his way, the real test is the “reflection” his wife manifests. Think with me for a moment about Christ being the “big man on (some other) campus” while His church grows bitter and distant by the day. That would not make sense. Similarly, it does not make sense for a husband to seek other interests elsewhere while distancing himself from his wife. Some women married for ten years or more have that wilting, withdrawn, and degenerative look to them. Their husbands have been doing other things, and the nourishing and cherishing these women were supposed to receive went toward other pursuits. These wives are wilting on the vine, a wilting that is different from external beauty. Anybody can paint a barn and change a few boards, but what you have is still quite evident–a decaying structure. What I’m talking about is an internal beauty that you cannot disguise. Many externally beautiful women in this world are spiritually rotting. There is a lonely, lost, and worn feel to them. They don’t glow no matter what color they dye their hair or how many times they Botox or even if they bought every pair of shoes and every dress on Fifth Avenue. They are spiritually withering. It’s a sad thing to see. You can look at their wedding pictures and see the life and hope that radiated from their faces. Then you see them ten years later and the inward beauty from their special day is gone. The most beautiful woman you’ll ever see is not a twenty-something hottie, but a sixty-something beauty who has been nourished and cherished by her husband. She glows. She has something Hollywood cannot replicate. She has imperishable beauty. Husband, you are the caretaker of this kind of beauty. If you have been married for at least five years, the imperishable beauty of your wife should be evident, even if only in embryonic form. If you have been married for ten years or more, who you are as a person and what you have done to your wife are evident, as shown by what your wife reflects through your nourishing, cherishing care. The Doctrine of Progressive Sanctification is the context in which the Savior operates on Christians. The job of the Savior is to remove every spot and wrinkle and any such thing that defiles His church. Husband, you are called to do similarly to your wife. Your covenant of marriage is the context in which you nourish and cherish (mature) your wife. Is she getting warmer? Husband, work through the two lists above, making notes where you believe you are excelling and where you need to improve. Have your wife do the same thing. Compare your list with her list and talk about why you both answered the way you did. Take the notes you both made and share with a couple you trust, asking them to help you.